The banana pancakes have been very popular in the blogging world of late, which basically means whisking together a banana with two eggs and frying them into the shape of pancakes. I tried it a while ago, and to be honest, it wasn't great. They were increadibly soft and hard to turn, tasted of ....yeah you're right...eggs and banana. This turn around I wanted to give them another go, and from the inspiration of other bloggers who have had the same problems as me I decided to add a little flour. But not just any flour. I want to stay away from wheat flour and such, since it has high GI ratings. So I thought; why not add coconut flour? Said and done. And the result? Brilliant! 1 large banana, medium ripe. Mix it all together with a rod mixer and fry in some butter. They need a little time to harden in their first side before you can flip them, but they turned out really well. Good firm and fluffy consistensy, with a nice banana/coconut flavour that will leave you wishing you had done more! 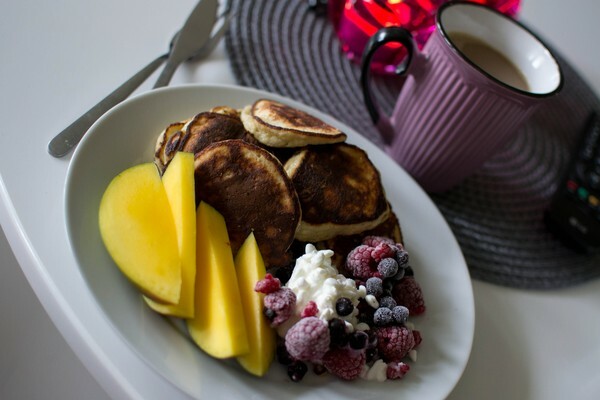 I served them with a little bit of mango, cottage cheese, quark and frozen berries. Highly recommended!